Stow, OH, USA (September 30, 2014) — SPIROL International Corporation is pleased to announce the recent achievement of gold level status in the Caterpillar Supplier Quality Excellence Process (SQEP) Recertification. SQEP (Supplier Quality Excellence Process) is Caterpillar's operational excellence initiative that recognizes a supplier's commitment to meet and sustain high quality standards. SQEP incorporates industry proven quality tools and system requirements (ISO, PPM, APQP, PPAP, SPC, TQM, Delivery, etc.) that ensure suppliers achieve superior quality and deliver best-in-class performance. The SQEP initiative is a critical aspect of SPIROL's on-going dedication to being a preferred supplier to Caterpillar. Says Gregg Neidlinger, SPIROL's Global Account Manager for Caterpillar, "Receiving the SQEP gold acknowledgement validates our global commitment to quality, service and support. From technical design and engineering support through delivery, our teams are fully engaged with CAT processes." Caterpillar's SQEP certification recognizes their supplier's dedication to providing excellence in quality, delivery and cost, and is only awarded to those who demonstrate such world-class performance on an ongoing basis. Each year, suppliers are evaluated with increasingly strict criteria for distinguishing outstanding supplier quality performance, exceptional service, capacity planning, and delivery performance. Caterpillar's manufacturing standard combines industry-proven quality system and process management requirements from ISO/TS16949 with demonstrated results to ensure expected supplier capability and performance. Caterpillar developed this program to place a renewed emphasis on supplier performance excellence. SPIROL's Quality Manager, Anthony Canda, stated "This is a huge accomplishment and a direct result of all successes the SPIROL team has driven towards over the past year. 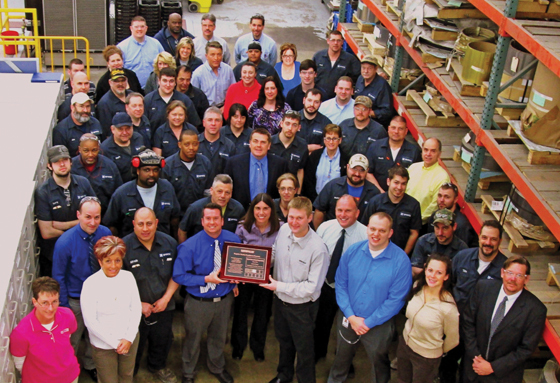 Creating the CAT manufacturing cells, improving our part mark and oiling processes, managing on-time shipments, and providing top quality products and service are just a few of items that deserve to be celebrated." SPIROL INTERNATIONAL CORPORATION is a leading manufacturer of a diverse line of engineered components for fastening and joining, including Precision Shims, Coiled Spring Pins, Slotted Spring Pins, Solid Pins, Disc Springs, Alignment Dowels and Bushings, Spacers, Compression Limiters, Threaded Inserts for Plastics, Machined Nuts, Pin and Insert Installation Equipment, and Vibratory Parts Feeders.